This oral history project collects and shares memories of life in Herne Hill, such as celebrations and floods, whether from long ago or more recently. We are keen to interview people who have lived or worked here over a long period. And you do not have to have been born before 1945 to take part! ‘History Hear: oral memories of Herne Hill’ is supported by the Herne Hill Forum and the Herne Hill Society, and is led by a small team of volunteers. The material will eventually be deposited with Lambeth and Southwark Archives. As well as hearing from people who might want to be interviewed, we would be grateful for assistance from anyone with interviewing or audio editing experience. We are also keen to make copies of photos of Herne Hill taken after 1930 that we can use to prompt memories. Sorry folks - it’s Ron (Milkwood Road) Crisp again, and with another query - this time about the photograph of Milkwood Road (above), used on the website quite by chance, I am told, and not dated or from any ‘archive’. 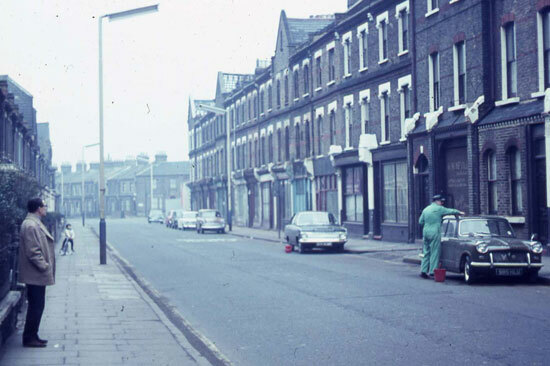 Looking towards Loughborough Junction, at the corner of Heron Road in the distance on the right, there seems to be a ‘gap’ or hoarding, where once stood the Milkwood Tavern - right opposite number ‘88’ where I lived from the late 1940s to the early 1960s. The pub was still there when I left home in 1961, as were the shops beside it - the newsagents/sweet shop, then a butchers (? ), then a gap, and a ‘run’ of shops which can be seen almost up to the vehicle gate at Nevill’s Bakery in the right foreground here. So, whose photograph is this, and was it part of a set of ‘views’ - and if so are there any more available which identify shop names, etc. any better than here, please? Oh, and of course, any memories evoked by this picture and shared here will add to the jigsaw. Hi Ron I lived at 103 Milkwood Rd next to Nevills where my father worked. I attended St Saviours School. My family are still friends with the people who had the sweetshop. The butcher was called Wally by the way. The grocers and post office was run by Mr and Mrs Fox. We left the area when I was 8 in 1964 but I have fond memories of my early years. The little boy on the bike is me, and that’s my Dad’s Vauxhall Victor across the road, outside Nevill’s Bakery, we live at 128, which is now an industrial estate.